Given that a manned mission to Mars is technically feasible now, but lacks only political and economic will, this item may or may not ”emerge,” but if it does, will undoubtedly spur not only technological innovations and scientific discoveries, but also provide a landmark historical event for an entire generation. Activities and discoveries in developmental biology – both how humans develop from a single cell, as well as the processes of aging – are proceeding very rapidly; both the length and, more importantly, the quality of life are likely to be extended over the next several decades. 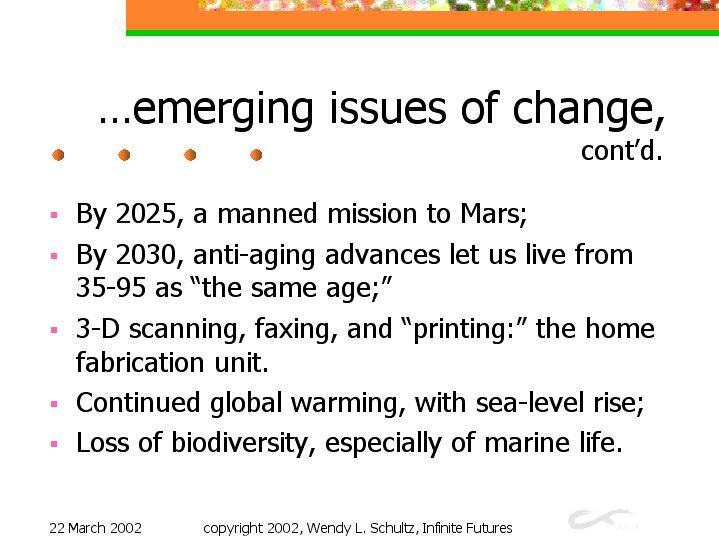 The last three items have no dates attached, but are listed last because estimates suggest large-scale emergence of effects and impacts might be three or four decades away. 3-D scanning and ”printing” already exist, in industrial applications, as do printers capable of printing scents. Those capabilities linked to innovations in micromachines and nanotechnological assemblers auger the possibility of home fabrication of material goods – customers would only need to buy the software specifying design and assembly. Loss of biodiversity, especially marine species, and accelerated global warming may well be intertwined emerging issues: the warmer the oceans, the greater the rate of coral extinction; the less plankton in the ocean, the less CO2 the ocean absorbs.